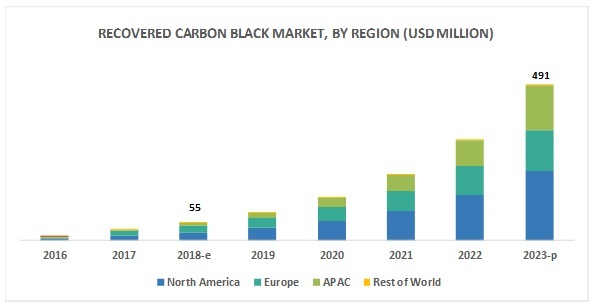 Recovered Carbon Black (rCB) Market by Application and Region - Global Forecast to 2023 | MarketsandMarkets™ INC.
[95 Pages Report] The market size for recovered carbon black is projected to grow from the estimated USD 55 million in 2018 to USD 491 million by 2023, at a compound annual growth rate (CAGR) of 55.0% during the forecast period. Recovered carbon black is widely used as an environmentally-friendly and sustainable reinforcing filler in tire and non-tire rubber products. 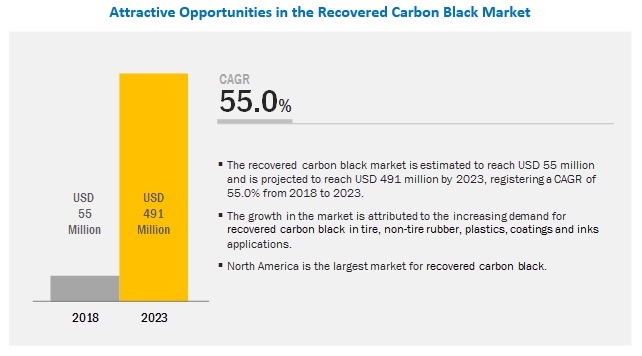 The growth of the recovered carbon black market is, therefore, directly associated with the growing demand for environmentally-friendly and sustainable reinforcing filler in tire and non-tire rubber applications. Non-tire rubber application is projected to be the second-fastest-growing market during the forecast period. Recovered carbon black is used as a reinforcing agent in the production of several non-tire rubber products. These products include conveyor belts, hoses, gaskets, seals, rubber sheets, geomembranes, and rubber roofing. It is also used in footwear rubber to impart abrasion resistance. The recovered carbon black increases the strength of mechanical rubber products as it has low ash content. The growth in this application is associated with the growing rubber industry and the rising need for environmentally-friendly products. North America is estimated to account for the largest market share during the forecast period. North America is estimated to dominate the overall recovered carbon black market in 2018. The region has emerged as the largest consumer of recovered carbon black, owing to the growth in production and consumption of recovered carbon black in countries such as the US, Canada, and Mexico. The problems arising from the dumping of end-of-life tires and the rising demand for environmentally-friendly products from tire, rubber, and automotive industries in these countries is expected to drive the market for recovered carbon black during the forecast period. Some of the leading players of the recovered carbon black market are Pyrolyx (Germany), Delta-Energy Group (US), Black Bear Carbon (Netherlands), Scandinavian Enviro Systems AB (Sweden), Klean Industries (Canada), Radhe Group of Energy (India), Alpha Carbone (France), Bolder Industries (US), DRON Industries (Slovakia), DVA Renewable Energy JSC (Vietnam), Enrestec (Taiwan), Integrated Resource Recovery (US), and SR2O Holdings (US). In December 2018, Scandinavian Enviro Systems AB (Sweden) signed a Memorandum of Understanding (MoU) with EE-TDF Cleveland (US), a company involved in tire recycling. Under this agreement, the companies will construct a recycling plant with a capacity of recycling about 30 kilotons tires/year at the existing site of EE-TDF Cleveland located in Texas, US. This agreement will enable Enviro to increase its footprint in the US market. In October 2018, Pyrolyx USA, a subsidiary of Pyrolyx (Germany), started construction of a plant at Terre Haute, Indiana, US. It is expected to be entirely built by May 2019 and is likely to be operational in June 2019. This plant will have a processing capacity of 40,000 tons of end-life-tires, annually, and will produce about 13 kilotons of recovered carbon black, 17.5 kilotons of pyrolysis oil, and 6.2 kilotons of steel. In June 2018, Scandinavian Enviro Systems AB (Sweden) signed an MoU with Treadcraft Limited (US), a tire recycling company, for establishing a recycling plant in New York, US. This plant will have a recycling capacity of about 30 kilotons tires/year and is expected to increase the presence of Enviro in the North American Market. What are the global trends in demand for recovered carbon black? Will the market witness an increase or decline in demand in the coming years? What is the estimated demand for recovered carbon black from tire application? What were the revenue pockets for the recovered carbon black market in 2017? What is the different regulation developed for the dumping of end-of-life tires globally? Who are the key players in the recovered carbon black market globally? The study involved four major activities in estimating the current market size for recovered carbon black. Exhaustive secondary research was done to collect information related to the recovered carbon black market, virgin carbon black market, and end-of-life tires market. The next step was to validate these findings, assumptions, and sizing with industry experts across the value chain through primary research. Both the top-down and bottom-up approaches were employed to estimate the overall market size. Thereafter, market breakdown and data triangulation were used to estimate the market size of the segments and subsegments. In the secondary research process, various secondary sources such as Hoovers, Bloomberg BusinessWeek, and Dun & Bradstreet have been referred to identify and collect information for this study. These secondary sources included annual reports, press releases & investor presentations of companies; white papers; certified publications; articles by recognized authors; gold standard & silver standard websites; regulatory bodies; trade directories; and databases. The recovered carbon black market comprises several stakeholders such as raw material suppliers, processors, end-product manufacturers, and regulatory organizations in the supply chain. The demand side of this market is characterized by the development of the tire, automotive, rubber, plastics, and inks industries and the growth in population. The supply side is characterized by advancements in technology. Various primary sources from both the supply and demand sides of the market were interviewed to obtain qualitative and quantitative information. All percentage shares and breakdowns were determined using secondary sources and verified through primary sources. After arriving at the total market size through the estimation process explained above, the overall market was split into several segments and subsegments. The data triangulation and market breakdown procedures were employed, wherever applicable, to complete the overall market size estimation process and arrive at the exact statistics for all segments and subsegments. The data was triangulated by studying various factors and trends from both the demand and supply sides. In addition, the market size was validated by using both top-down and bottom-up approaches. Then, it was verified through primary interviews. Hence, for every data segment, there are three sources-top-down approach, bottom-up approach, and expert interviews. The data was assumed to be correct when the values arrived at from the three sources matched. Pyrolyx (Germany), Delta-Energy Group (US), Black Bear Carbon (Netherlands), Scandinavian Enviro Systems AB (Sweden), Klean Industries (Canada), Radhe Group of Energy (India), and Bolder Industries (US), among the total 17 key players covered. This research report categorizes the global recovered carbon black market on the basis of application and region.